The pilot wire connectors are specially designed and made to connect the pilot wire rope, and pulling rope to pass over the conductor pulleys, bull wheels of hydraulic puller or puller-tensioner. It is processed from high strength forged steel, and galvanised. The special profile minimizes the overload on the rope spliced eyes during the passage. 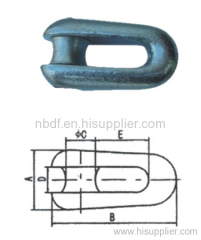 The pilot wire connectors are specially designed and made to connect the pilot wire rope, and pulling rope to pass over the conductor pulleys. Group of Fixed joints has been presented above, want more	Fixed joints and pilot wire connectors, Please Contact Us.